The Asheville Art Museum proudly presents Hands in Harmony: Traditional Crafts and Music in Appalachia, Photographs by Tim Barnwell from Friday, May 14, 2010 to Sunday, October 10, 2010. The public is invited to an Opening Reception Friday, May 14, 2010 from 5:00 to 7:00 p.m. This exhibition is a photographic exploration of the makers of Appalachian folk music and traditional handcrafts by photographer Tim Barnwell. 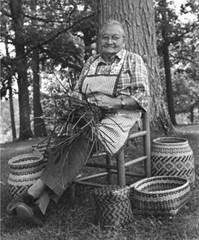 It includes approximately 30 black-and-white photographic portraits of well-known figures in the Appalachian music and crafts communities and images of some who are not as well known. The images are drawn from Barnwell’s three decades in photography. They speak to the beauty and uniqueness of handmade objects and their creators as well as the musical heritage carried on by the traditional musicians of the region. Barnwell (1955 - ) was born in Franklin, North Carolina. He started taking photographs at age 10, when he bought a camera from his uncle. He served as Executive Director of the Appalachian Photographic Workshops based in Asheville, NC from 1980 to 1988. Barnwell’s background is photojournalism; he has had over 60 articles and 1,000 photographs published to date. Barnwell’s work has been widely exhibited and is in the permanent collections of the Metropolitan Museum of Art, Asheville Art Museum, the New Orleans Museum of Art, the Greenville County Museum of Art, Western Carolina University, Mars Hill College and R.J. Reynolds Industries. His book, Hands in Harmony: Traditional Crafts and Music in Appalachia was published by W.W. Norton Books in fall 2009 and is available in the Museum Shop. This exhibition was organized and curated by the Asheville Art Museum. This exhibition is sponsored in part by Asheville Eye Associates, the Judy Appleton Memorial Fund, Ann and Ted Oliver, Suzanne and Stephen Jones, f/32 Photography Group and Ms. Sally Kennedy. For additional information and high-resolution images, please contact Kim Zdanowicz, Communications Manager at 828.253.3227, ext. 116 or [email protected].